sE Electronics and Rupert Neve Designs have teamed up to deliver a special package: the RNT multi-pattern condenser. A modern take on vintage tube technology and sound: the RNT is the brainchild of an sE Electronics and Rupert Neve Designs collaboration and packed with high-end quality. Judging from the microphones features, it really does seem to capture the best of both Rupert Neve’s and sE’s pedigrees in transformer and microphone design. The custom large-diaphragm capsule is reported to be the “finest that sE has ever made“, with nine polar patterns, ranging from omni-directional, cardioid and figure-8, with gradients in between. It seems an obvious choice for lead vocal duties, but its flexibility would make the RNT feel at home just about anywhere in the studio. There are two active stages of electronics, the first being the low-noise ECC82 tube inside the microphone itself. The second stage is within the connecting floor box, which controls the high-pass filter, gain switch and polar pattern. sE tell us that “this stage is built around the same custom op-amps used in Rupert Neve Designs flagship 5088 console”. 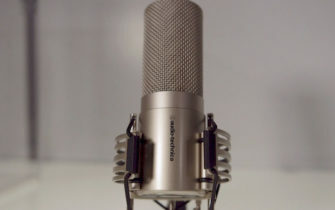 Be prepared to fork out a pretty penny (around $3,500 US) for this mic. But of course, this kind of quality in microphone engineering does not come cheap. Check out sE Electronics for more information.